At CivilPolitics, one of our service offerings is to help groups that are doing work connecting individuals who may disagree about political and moral issues. These disagreements do not necessarily have to be about partisanship. One organization that we work with is Living Room Conversations, a California based non-profit that holds small gatherings co-hosted by individuals who may disagree about a particular issue, in order to conciously foster non-judgmental sharing about potentially contentious issues. Below is a description from their website, in addition to a short video. Living Room Conversations are designed to revitalize the art of conversation among people with diverse views and remind us all of the power and beauty of civil discourse. Living Room Conversations enable people to come together through their social networks, as friends and friends of friends to engage in a self-guided conversation about any chosen issue. Typically conversations have self-identified co-hosts who hold differing views. They may be from different ethnic groups, socio-economic backgrounds or political parties. Each co-host invites two of their friends to join the conversation. Participants follow an easy to use format offering a structure and a set of questions for getting acquainted with each other and with each other’s viewpoints on the topic of the conversation. Living Room Conversations is currently holding conversations around the issue of “realignment” in California, which is designed to alleviate prison overcrowding and where many would like to develop alternatives to jail for non-violent criminals. Living Room Conversations wanted help understanding the effects of their program so we worked with them to develop a survey appropriate for their audience, asking people about their attitudes before and after conversations. 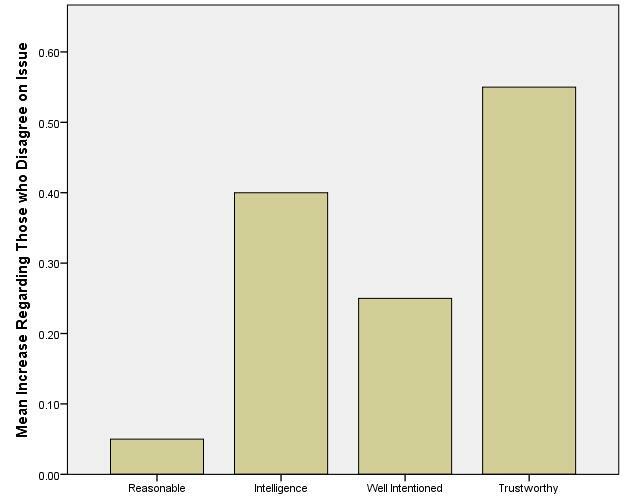 Informed by work in psychology, we looked at how reasonable, intelligent, well-intentioned, and trustworthy people perceived those on the opposite side of the issue to be, compared to how they perceived them before the meeting. Results, based on a 7-point scale, are plotted below. The fact that all scores are greater than zero means that people felt that individuals who disagreed with them on these issues were more reasonable, intelligent, well-intentioned, and trustworthy compared to how they felt before the conversation (though with a sample size of only 23 individuals so far, only the increase in trustworthiness is statistically significant). There was still a stark difference between how people felt about those who disagreed on these issues compared to how they felt about people who they agreed with, as respondents both before and after the event felt that those they agreed with were more likely to be reasonable, intelligent, well-intentioned, and trustworthy. As well, we asked people about their attitudes about realignment policy and people’s attitudes about the issue didn’t change. However, civility, as we define it, is not the absence of disagreement, but rather being able to disagree in a civil way that respects the intentions of others. Moreover, even if people’s minds hadn’t changed with respect to others, individuals felt strongly (8+ on a 10 point scale) that talking with others that hold different views is valuable. Research on the effects of such positive contact would indicate that if these individuals do follow through on this course, they will likely end up building on these attitudinal gains toward those who disagree. Given that, these conversations appear to be a step in the right direction.